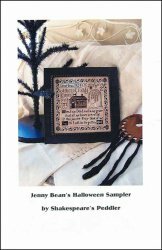 Jenny Bean's Halloween Sampler [D5782] - $12.00 : Yarn Tree, Your wholesale source for cross stitch supplies. Cross stitch pattern by Shakespeare's Peddler. The saying, "When I am dead and in my grave and all my bones are rottin' If this you see- Pray- think of me or I will be forgotten," is stitched at the bottom of this design with a house, gravestone & alphabet stitched above. A border is stitched around this design to complete it. Stitch count is approximately 160L x 160W.